2012, Gaydon: With the final design signed-off and engineering development work progressing apace, Aston Martin today reveals the first images of the new V12 Zagato (road car) scheduled for production later this year. 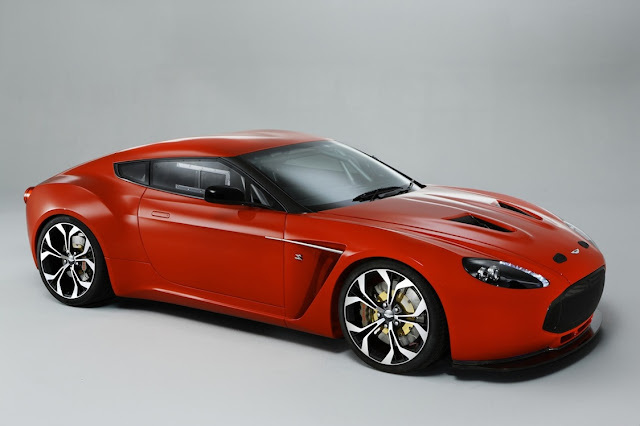 The V12 Zagato is the pinnacle of the Vantage range. It is also the latest expression of a successful creative collaboration that has given rise to a series of striking GT cars over the last half-century, the original and most iconic of which being the DB4GT Zagato. Not only does this masterpiece rank amongst the most desirable, collectable and valuable cars in history, its 50th anniversary provided the inspiration for the V12 Zagato . The advanced Zagato 5935cc,48-VALVE V12 engine produces a peak output of 510 Bhp (380 kW) at 6500 rpm and torque 570 Nm at 5750 rpm, making the Aston Zagato one of the most powerful racing cars in its segment. Accelerating from 0-100K mph takes just 4.2 seconds.Top speed is 305 Kmph. It also having FULLY CATALYSED STAINLESS STEEL EXHAUST SYSTEM WITH ACTIVE BYPASS VALVES. SHORES OF LAKE COMO, ITALY.